Beauty is all about what’s on the inside and it’s important to keep those insides healthy and happy through small acts of self-care. Self-care has a lot to do with how we feel about ourselves and one self-care tip I want to share is my love for herbal tea. I can make a cup of tea and instantly feel happy and relaxed and as if I allowed myself just a few minutes to take a breath from the stress of the day. 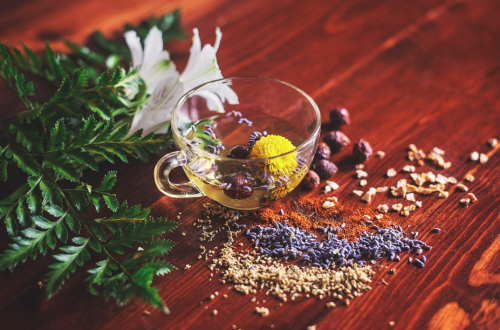 Herbal tea is so great for so many things from ginger tea for tummy troubles to chamomile for sleep, but did you know drinking herbal tea may be a great thing to add to your current beauty routine? 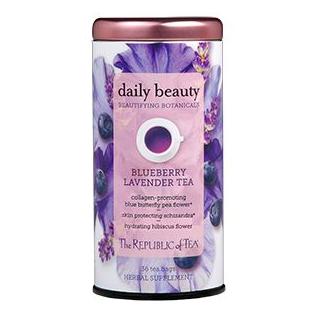 The Republic of Tea is a long-time favorite brand of mine and I just discovered a new line from them called Beautifying Botanicals. They have two herbal teas formulated for beautiful skin and I just had to share them with you. These teas are packed with botanicals to enhance our natural beauty from the inside. Adding a bright and happy herbal tea to your daily self-care beauty routine is a great way to indulge deliciously. So, what’s the type about herbal tea in the first place? Tea has been consumed for thousands of years for its health benefits and it is thought that the second emperor of china, Shen Nung, discovered tea back in 2737 BCE by dropping a leaf into his hot water. Since then, people have been researching and using tea as not only a tasty beverage, but a health tonic and even a liniment (oil or lotion applied to the skin) or a poultice (a wet, mass of plant material applied to the skin). 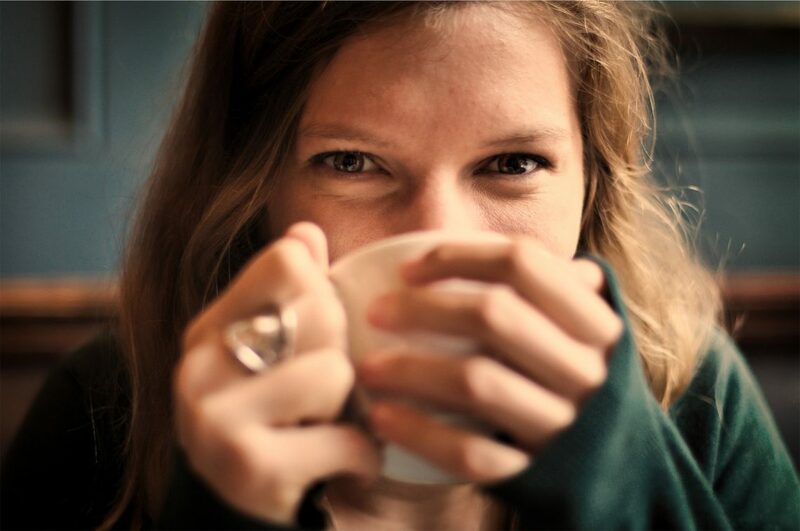 The health benefits of tea are believed to be the result of the high polyphenol content in tea. Polyphenols are chemicals that naturally occur in plants and have been known to have a variety of health benefits when consumed. Polyphenols can help with many conditions such as diabetes, obesity, inflammation and skin conditions. The two teas I’m going to talk about have some amazing herbs in them known to beautify skin and the best part about this is that it’s easy to get the benefits. Just make a cup of this tea and enjoy! 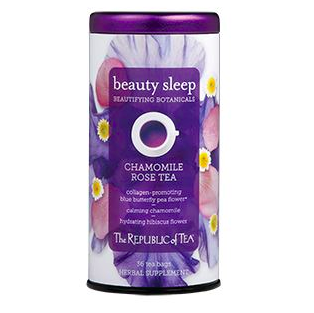 The Republic of Tea Beautifying Botanicals Beauty Sleep-Rose Chamomile: This tea is a lovely herbal tea for relaxing and winding down at the end of the day. Chamomile has been used for thousands of years for its ability to help us sleep and soothe skin and it’s been a favorite herbal of tea of mine since I was a child. I love chamomile when I am feeling stressed and just can’t turn off my mind. Rose is not just a beautiful flower, but a gentle powerhouse for the skin. I use a rose hydrosol daily on my skin and have seen my skin become brighter and clearer. 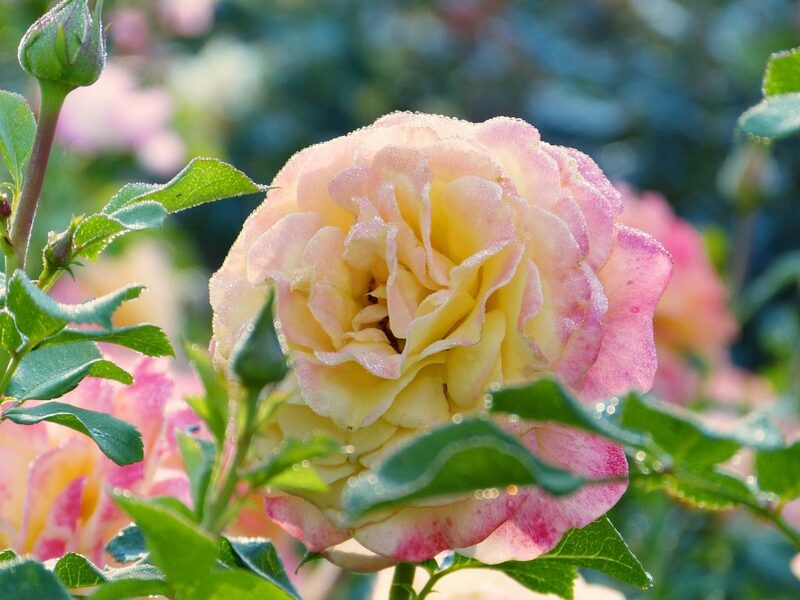 Rose is a natural anti-inflammatory for skin, reducing redness and irritation and the scent of rose is great to calm the sense in times of stress. The taste of this tea is a light, subtle and refreshing. 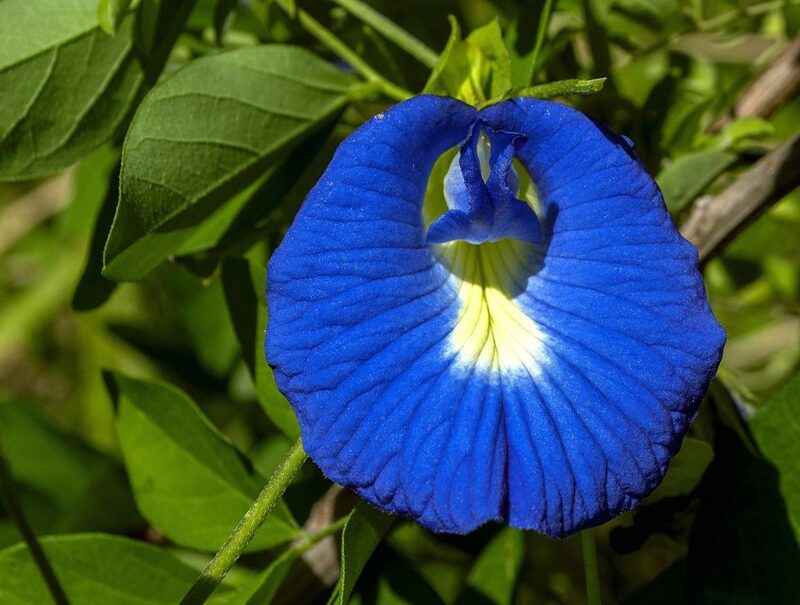 It also has butterfly pea flower which aids in the skin collagen production. Along with being a delicious tea to drink, you are doing your skin some good at the same time. This tea is so good. I’ve been drinking it as an iced tea and it’s so refreshing and crisp. If you are a fan of fruity teas, you will love this. The blueberry flavor is bright and fruity and blueberries are known to be an antioxidant to the body. They are also great for brain health. 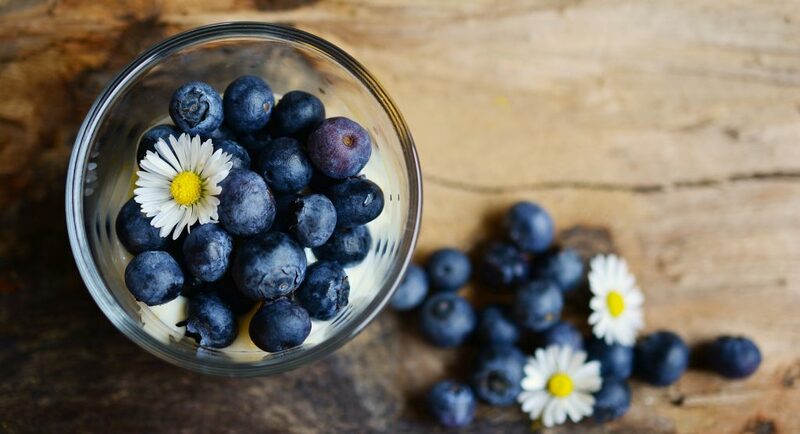 Blueberries are a great addition to a healthy diet and they enhance beauty too! A cup of blueberries provides almost a quarter of our daily Vitamin C needs and Vitamin C is important in collagen production. 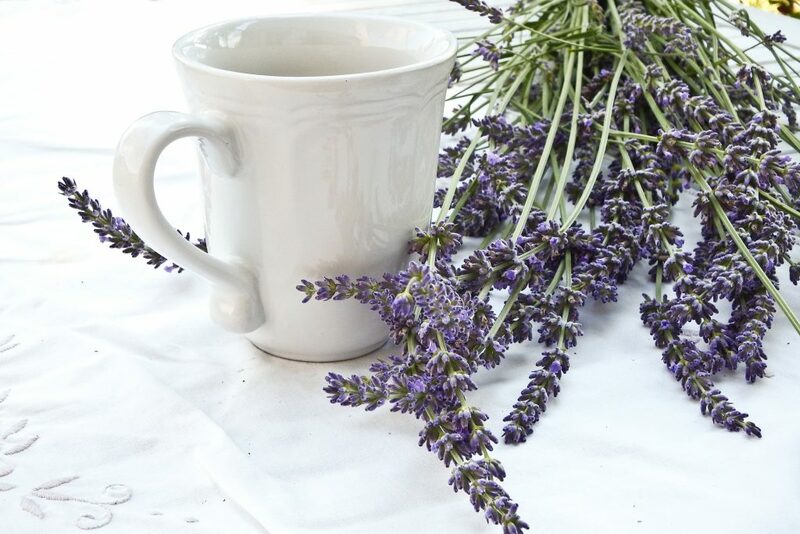 The addition of Lavender is a restful herb, helping us relax and take off the stress of the day. 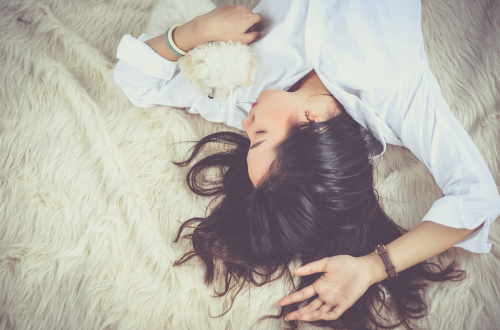 As this article states, beauty sleep really is more than just a popular saying. Sleep is important to rejuvenate our minds and increase blood flow to the face, bringing on glowing skin. Lavender is also helpful for those with problem skin due to its antibacterial and soothing properties. 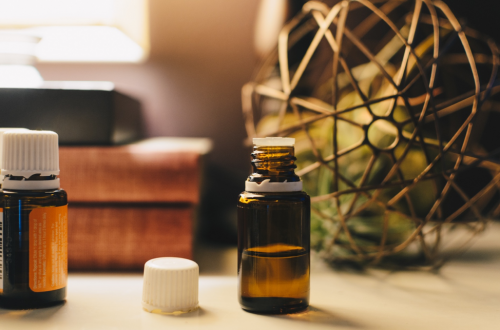 It also contains other amazing botanicals such as chamomile to help with sleeplessness and rosehip which is known for being its anti-aging properties. I encourage you to check out the other awesome teas on the website and read up on how great tea is for you. There are so many different types and forms and it’s almost impossible not to find one that fits your lifestyle. Take a moment out of your day and have a cup of tea, take a few deep breaths and enjoy your surroundings as a part of your self-care routine.